I’m sorry I haven’t posted in a while. 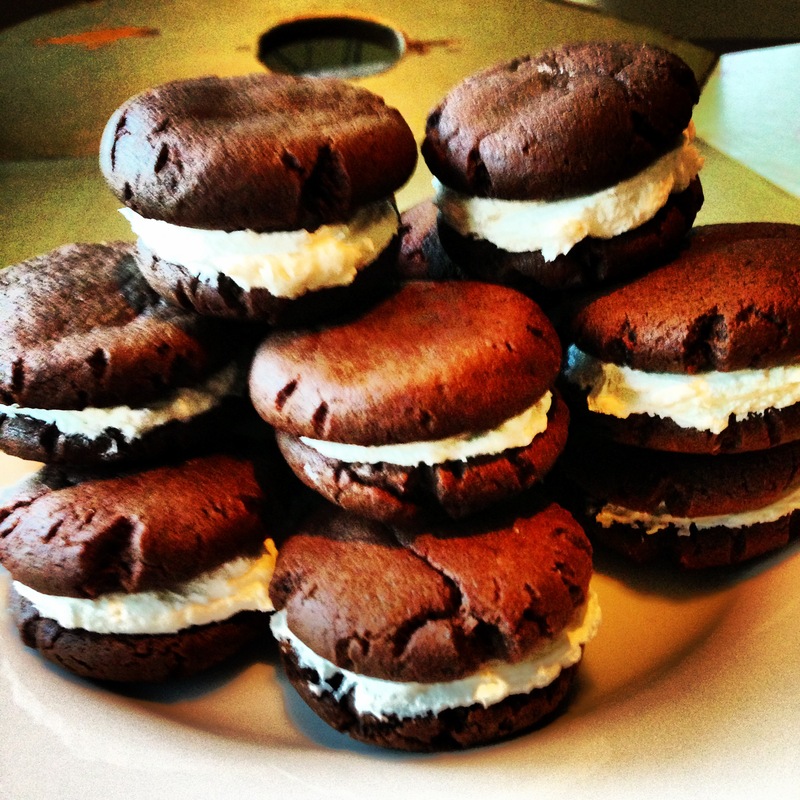 I’m pretty sure you’ll forgive me and then some once you make these Homemade Oreos. While most of my favorite sandwiches involve butter, carbs and cheese these little sandwich cookies are not messing around. 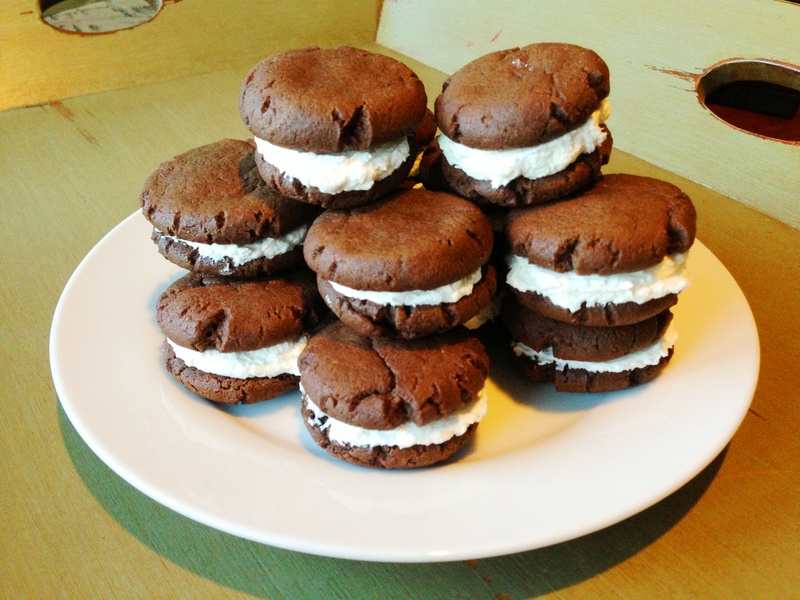 They aren’t as crunchy as store bought or cakey like whoopie pies but they beat the bagged variety of Oreos hands down…And to be clear the filling is butter, shortening and sugar…. February survival food at its finest. Dip these in milk and it’s all over. A new staple recipe has emerged. Did I mention how easy they are to make? You could also put a little more effort than I did into making them uniform and traditional Oreo-looking. I distributed some to my girlfriends, and one realized she had received an Oreo that looked slightly more like a Double Stuffed Oreo. You can imagine the others’ hearts were broken. The recipe said this would make 48 and I made about half that… apparently was a little aggressive with my cookie size. Cookie time: Sift together flour, cocoa, baking soda and salt in a large bowl. In a separate bowl beat the butter for one minute on high with a handheld or stand mixer. Beat in the granulated and brown sugar on medium high until combined. Beat in egg and vanilla, scraping down sides and bottom of bowl as necessary. Add the dry ingredients to the wet ingredients and beat gently on low (dry ingredients will want to destroy your kitchen) until a dough is formed. It will look like clay. Cover with foil or plastic wrap and chill in the refrigerator for 30 minutes. If you skip this step and your cookies don’t turn out no one will feel bad for you. Preheat the oven to 350 degrees. Remove the cookie dough from the fridge. 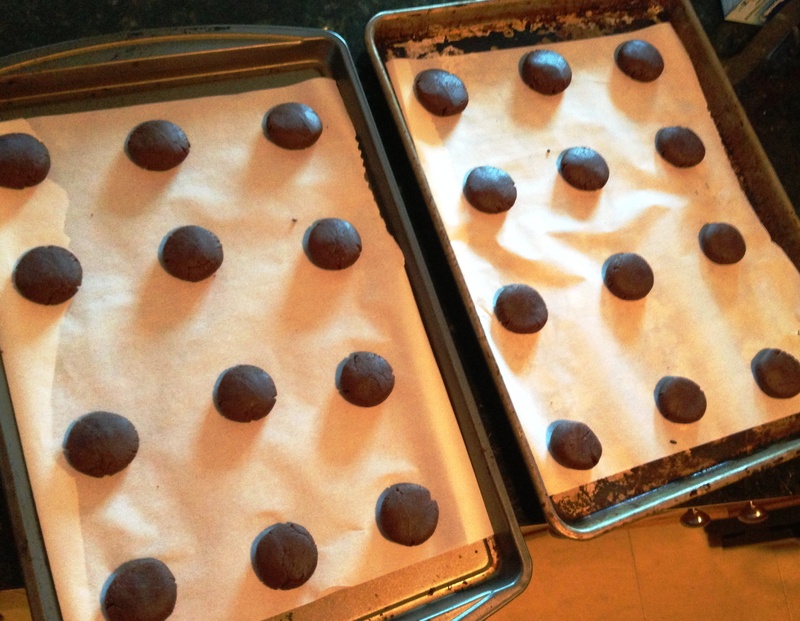 Roll two teaspoons of dough at a time into balls and set on parchment paper lined baking sheets. 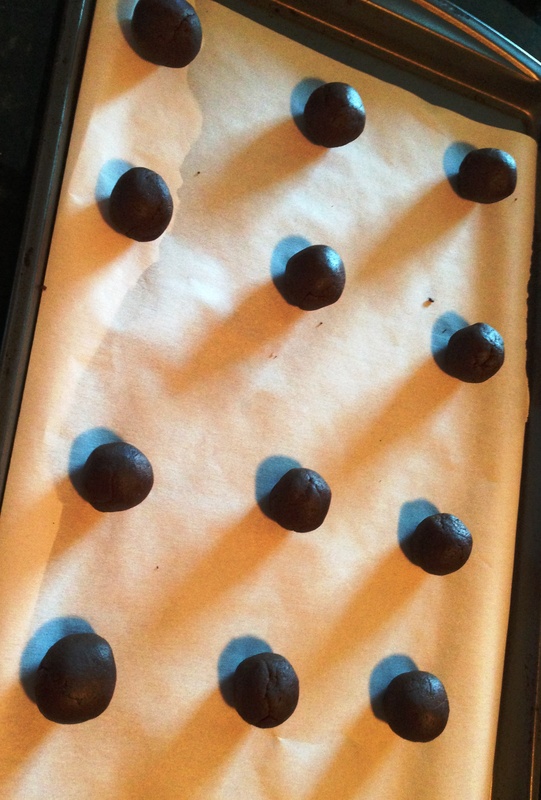 Press down on the balls to slightly flatten. Bake each batch for 6 minutes. Let cool for 5 minutes on the baking sheet then transfer to a wire rack to cool. Make sure you have an even number these are Oreos after all. Cream filling time: Using a handheld or stand mixer combine the butter and shortening on high for one minute. Add the sugar and vanilla. Beat on low for one minutes and then high for one more minute. This will be a very thick filling. You could add peppermint extract and green food coloring at this point if you want to get all St Patrick’s Day on these cookies (other idea for St Patrick’s Day: Green Tea Muffins). Spread the filling between two cooled cookies. Repeat until you have an Oreo Cookie pile in front of you. 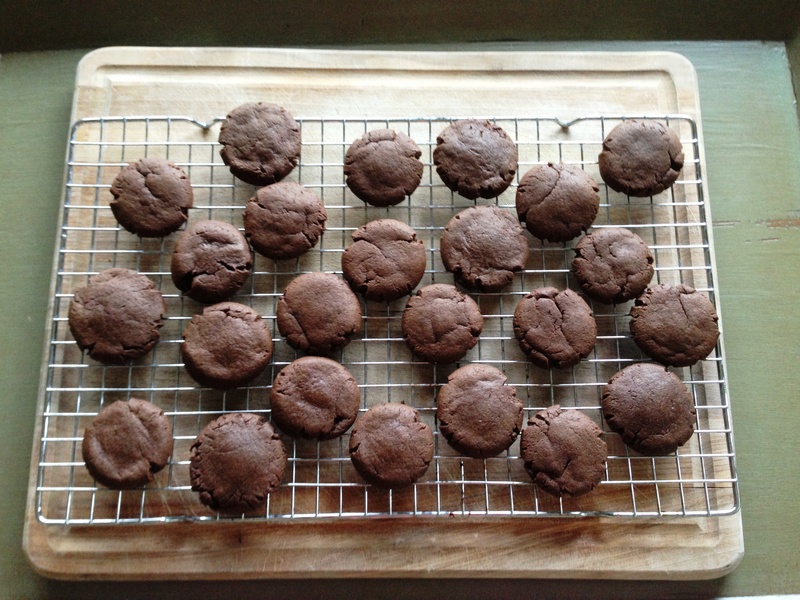 Cookies stay fresh covered at room temperature for up to 1 week or freeze well up to two months.